It is easy to gauge which filmmakers give importance to the sound of their movies. In Akshat Verma’s case, the music for his directorial debut Kaalakaandi was expected to be of a certain standard (and experimental) considering the precedence was Delhi Belly where Ram Sampath soared with an offbeat, multi-genre album. It was Abhinay Deo who directed the 2011 film, but Verma’s association with it as the writer (and lyricist for a couple of tracks) meant Kaalakaandi came with certain expectations. Akshat Verma roped in Sameer Uddin – who mostly has background scores in his repertoire – to helm the music department where the ‘it happened all in one-night’ story takes the forefront in the character of the soundtrack. Just 15 minutes long, the album starts with the excellent ‘Swagpur ka Chaudhary’. The electro-funk, foot-tapping number, composed by Uddin and written and sung by Akshay Verma, is zingy and trippy. ‘Kaala Doreya’ is the recreated version of the famous folk Punjabi classic and is infectious. Uddin gets Neha Bhasin to sing the song along with Raxstar, to rap. The recreation is top-notch and manages to stand out (well) from the other songs on the album. ‘Jive With Me’ would broadly come under the swing genre and exhibits Uddin’s capabilities as a composer. Abhishek Nailwal does an adequate job behind the mic in ‘Jive With Me’. However, he could’ve turned the good song great (like Sunidhi Chauhan made Shankar-Ehsaan-Loy’s swing number ‘Girls Like To Swing’ from Dil Dhadakne Do even better with her brilliant vocals) if the singing was a tad bit more dominant and improved. Naliwal accompanies the excellent Vishal Dadlani in Uddin’s last song in the album, ‘Aa Bhi Jaa’, written by Anvita Dutt. While the vocals are strong and orchestration is quite interesting with a multitude of sounds, the tune is unremarkable. Shashwat Sachdev of Phillauri fame is the composer behind the title track ‘Kaalakaandi’ and once again shows his affinity for sticking to Indian roots. In his only composition for the film, he layers the folk base with a modern electronic sound (like ‘Naughty Billo’ in Sachdev’s debut). The full Phillauri team is back with Vivek Hariharan and Romy handling the fantastic vocals (along with Sachdev and Arun Kamath) and Anvitta Dutt writing the very quirky lyrics. Uddin is an experienced hand at composing background scores in Bollywood and his last venture, Bareilly Ki Barfi, received acclaim. 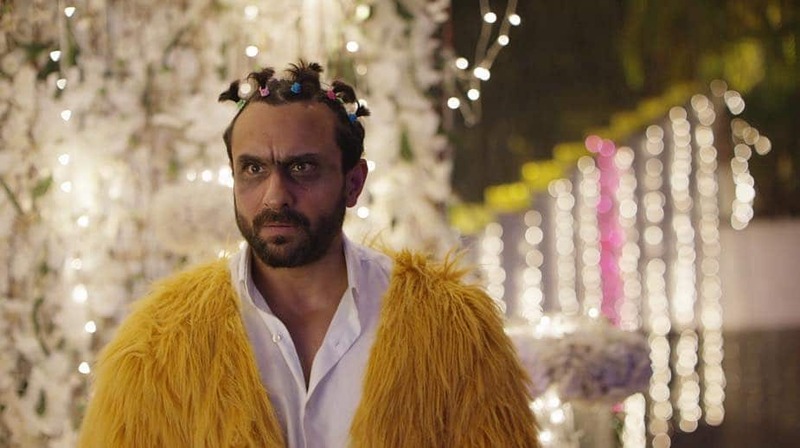 The background score for Kaalakaandi complements the film’s premise and wackiness. Uddin does a stellar job here and tinkers with genres – from electro-funk that grips the wavering acid trip visuals to post-rock which stirs the existential dread. The guitar dominates the score and showcases guitarist Chandresh Kudwa’s expertise. Sameer Uddin impresses a lot with this venture and excels in the familiar role of composing the background score, as well as composing original songs (and brilliantly revisiting another) in Kaalakaandi.